To celebrate Educator Appreciation Days, Kobo and Borders want to give you and your favorite teacher Kobo Wireless eReaders. Just tell us about your favorite teacher in 250 words or less and you could win! Click here to enter. This is an ongoing essay contest. Write an essay of 300 words or less describing a true story describing the most difficult decision you’ve had to make choosing between right and wrong. The current contest ends Dec. 31, 2009, but a new contest will begin January 1, 2010. Information on lots of other contests is available in the Members Section of the YAAGroup.org. April marks the 14th anniversary of National Poetry Month. To help celebrate, budding Emily Dickinsons and Edgar Allan Poes are encouraged to participate in the 3rd annual “Paws for Poetry” Contest (PawsforPoetry.org). To enter, children ages 5-12 are to write a poem to, and provide a photo of, their favorite animal friend. The contest is co-sponsored by kids’ virtual field trip Web site Meet Me at the Corner (MeetMeAtTheCorner.org) and Flashlight Press (FlashLightPress.com ). Original poems of any length may be submitted in one of two categories: Group One (ages 5-9) and Group Two (ages 10-12). One grand prize winner in each category will receive a prize package worth $50.00. Two runners-up in each category will receive a $25.00 gift package. Children’s author, poet, and Iraqi war veteran Thad Krasnesky, writer of the upcoming “That Cat Can’t Stay” (Flashlight Press, 2010) is the contest judge. In addition to the prize packages, winning poems and pet photos will be highlighted in an upcoming Meet Me at the Corner video pod cast. The pod cast will be videotaped at New York’s Angellicle Cat Rescue Center. Local students will present the winning poems. All submissions should be mailed to “Paws for Poetry” Contest, c/o Meet Me at the Corner, 20 West Del Norte, Colorado Springs, CO, 80908. The contest deadline is April 15, 2010. 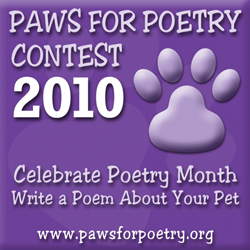 For more information, rules and submission guidelines, visit PawsforPoetry.org.